15. THOMAS15GRESHAM SR. (John14, John13 Jr., John12 Sr., Gent John11, Edward10, Thomas9, William8, John7, John6, James5, John4, John3, Edward2, Edward1) was born in 1751 in Abbington, Hartford Co. Md.. He died on 05 Oct 1804 in Jonesboro, Washington Co. Tn. i) JOHN16 GRESHAM SR. was born about 1770 in Md. He died about 1862 in Morgan Co. Mo..
ii) FULLER GRESHAM was born in 1778. He married MARTHA ELLIS. iii) BETSY GRESHAM was born in 1782. She married JAMES ELLIS. iv) RHODA GRESHAM was born in 1784. She married WILLIAM ANDERSON. v) SUSANNAH GRESHAM was born in 1786. She married GEORGE CROUCH. vi) PREON GRESHAM was born in 1788. He married NANCY LANE. viii) ANNA GRESHAM was born in 1794. She died on 20 May 1858. She married ARCHIBALD HALE. ix) SIMEON GRESHAM was born in 1794. He married SALLY PASTE. 16. JOHN16GRESHAM SR. (Thomas15 Sr., John14, John13 Jr., John12 Sr., Gent John11, Edward10,Thomas9, William8, John7, John6, James5, John4, John3, Edward2, Edward1) was born about 1770 in Md.. He died about 1862 in Morgan Co. Mo. i) ALEXANDER MOSES17 GRISHAM was born in North Carolina. ii) ANN GRISHAM. She died in 1877. She married ARCHIBALD HALE. iv) ELIZABETH GRISHAM. She died in Cherokee, Al. She married JOHN S. WILSON. v) HALE GRISHAM. He died in 1877.
vi) MARY K. GRISHAM. She died in 1871.
vii) RHODA GRISHAM. She died in Lincoln, Il. She married JAMES WEAR. xi) GEORGE HALE GRISHAM was born about 1790 in Washington Co. Tn. He died in 1878.
xii) ARCHIBALD GRISHAM was born on 26 Dec 1800 in Washington Co. Tn.. He died on 06 Mar 1885 in Bond Co. Il.. He married MARY MITCHEL REYNOLDS on 30 Mar 1822. She died on 21 Mar 1889 in Bond Co. Ill.
xiii) JOHN GRISHAM was born on 18 Aug 1810 in Washington Co. Tn.. He died on 21 Jan 1887 in Dutch Mills, Washington Co. Ar.. He married on 19 Jan 1834 in Washington Co. Tn. James Madison (1844-1905), the great-great-grandson of Thomas, was the oldest son of John Fuller Gresham and Matilda Louisa (Carroll/Ellis). He married Mary Elizabeth Barnes and they had a family of ten children, most of whom were members at Hales Chapel. Their home place burned in 1985 but was on the land now known as Buffalo Ridge Estates. This was home for Ida and Belle Gresham until they were up in years and moved to Jonesborough. Here their sister, Hassie, joined them when she retired from teaching school in Knoxville, and their brother, James Madison, Jr., when he retired as a lawyer in Oklahoma. Several of the other children married and settled in this community and their descendants are still at Hales Chapel. Charles S. [Sumner] married Minnie [Eckel] Hale, [daughter of William Chamberlain Hale and Sarah Frances Leab.] 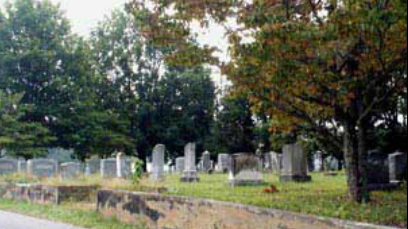 Horace M. married Bessie Keyes and his home was near the Gresham Cemetery until he moved to Jonesborough. Cordelia married James A. Keebler and their home was near the intersection of the Buffalo Ridge and Jonesborough road known as Keebler's Crossroads. William Winter's home was in Oklahoma, but he is buried in the Gresham Cemetery along with most of the rest of this family. George Newman was also a lawyer and John Fuller, Jr.'s home was in Knoxville where he was in the dry-goods business. James Madison's sisters, Amanda E. married Julius A. Stafford and Mary E. married Jacob Bacon and they are all listed as early members of hales Chapel. He also had two brothers, George E. who died young and John A. who married Sarah E. Neil in Knoxville.